Get hands-on experience sharing your in-depth knowledge of the practice and techniques. Deepen you personal practice and learn to bring your yoga off of the mat. Work with others in building a solid foundation in your understanding of how to the hot yoga sequence works. Trainees will be provided a general overview of the human body, with brief discussions on human physiology. With this basic understanding of anatomy and its terms, trainees will delve deeper into each of the postures taught in traditional hot yoga classes. 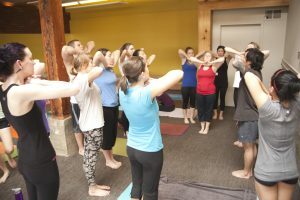 As teachers-in-training of such a specific yoga practice, it is important that students have a thorough understanding of why the asanas are placed in the order that they are in the hot room. In this module, we will also discuss the appropriate modifications or alternative asana suggestions for students with special needs, such as rotator cuff injuries, pregnancy, etcetera. Trainees will learn the basic principles of maintaining a traditional hot yoga room environment. With practice in studio, students will learn to read and adjust various mechanisms to monitor humidity, heating/cooling systems. They will also be taught and given practice to follow: studio opening/closing procedures, student check-in, supply management, reception area and yoga studio maintenance. $500 which will be applied to your tuition payment. This fee also covers all classes taken at any Hot on Yoga location while enrolled in the teacher training. Once accepted into teacher training the deposit is non refundable. However, should you enroll and then be unable to participate, we will honor your deposit and any additional monies received towards a future YTTP or Hot On Yoga training of your choosing when circumstances are more conducive.